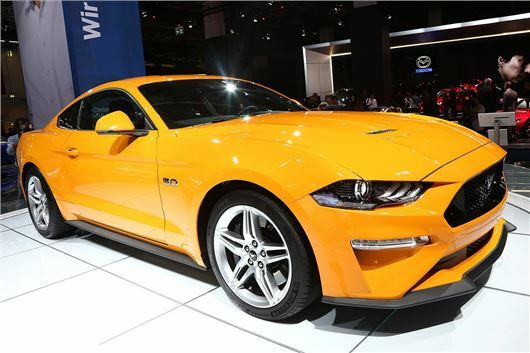 Ford has announced details of its improved Mustang, which gets updated, sleeker styling, more power and a new 10-speed automatic transmission option. The updated model is due to go on sale before the end of the year and will cost roughly the same – from around £34,000. The 5.0-litre V8 model has had its power turned up from 416PS to 450PS. Ford says this extra power, allied to the new, quick-shifting 10-speed automatic transmission, makes the updated Mustang accelerate faster than any previous version, with an estimated 0-62mph of “less than four seconds.” The 10-speed auto is also available with the 2.3-litre Ecoboost engine. Other changes include the addition of new driving modes. Drag Strip mode optimises shifts for the best acceleration, plus there’s a more useful My Mode that enables settings to be customised to suit the driver's tastes. Additionally, there’s a new active exhaust system that sounds more purposeful, but that can also automatically adjust at certain times to stop you waking your neighbours. Among the new tech on the updated car is pre-collision assist with pedestrian detection, adaptive cruise control, lane departure warning and lane keep assist. There’s also a new, optional, 12-inch fully-digital instrument display.